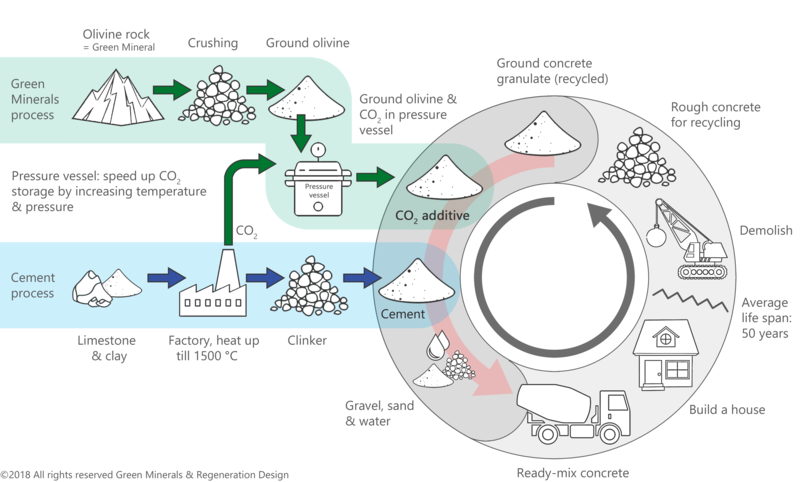 During the three-year research project CO2MIN, HeidelbergCement and RWTH Aachen University will explore the reaction of CO2 by the minerals olivine and basalt. Read here the press release. In the future, the carbonised minerals could be used as a value-added additive in the production of building materials. HeidelbergCement and RWTH are supported by the Potsdam Institute for Advanced Sustainability Studies (IASS) and the Dutch start-up Green Minerals. The minerals olivine (photo by Hannes Grobe) and basalt (see header image) are able to bind CO2. 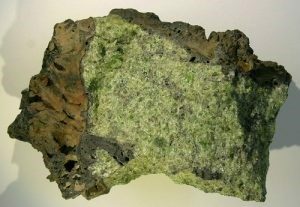 The natural minerals olivine and basalt are able to bind CO2 over their entire life-cycle. With natural absorption, it takes decades until the minerals are saturated with the greenhouse gas. The research project intends to speed up the absorption process. If successful, carbonised minerals can be used for various product applications. In the first year the research focuses on the investigation of different minerals in small-scale experiments. The carbonation of the most suitable minerals will be tested under realistic process conditions in the following year. The experiments will be conducted by the institute of Process Metallurgy and Metal Recycling (IME), which also is the coordinator of the RWTH group. Life-cycle assessments (RWTH) as well as analyses of economic aspects and social acceptance (IASS) complete this project phase. In the third year, marketability and acceptance will be further optimised through intensive cooperation with customers. An open acces report is published with the first results. Abstract: Magnesium carbonate powders are essential in the manufacture of basic refractories capable of withstanding extremely high temperatures and for special types of cement and powders used in the paper, rubber, and pharmaceutical industries. 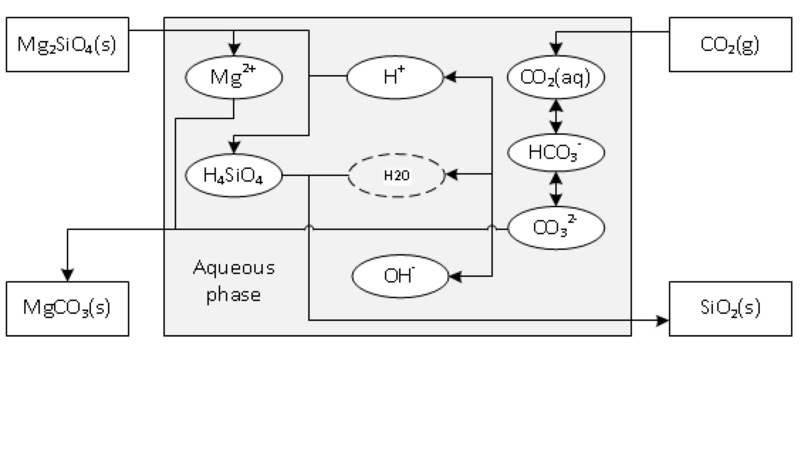 A novel synthesis route is based on CO2 absorption/sequestration by minerals. This combines the global challenge of climate change with materials development. Carbon dioxide has the fourth highest composition in earth’s atmosphere next to nitrogen, oxygen and argon and plays a big role in global warming due to the greenhouse effect. Because of the significant increase of CO2 emissions, mineral carbonation is a promising process in which carbon oxide reacts with materials with high metal oxide composition to form chemically stable and insoluble metal carbonate. The formed carbonate has long-term stability and does not influence the earth’s atmosphere. Therefore, it is a feasible and safe method to bind carbon dioxide in carbonate compounds such as magnesite. The subject of this work is the carbonation of an olivine (Mg2SiO4) and synthetic magnesia sample (>97 wt% MgO) under high pressure and temperature in an autoclave. Jos Kronemeijer of DELTA Concrete Consult will give support in short-term applications and new concrete technology. Jos has over 25 years in-depth experience with concrete and cementitious materials in construction projects. Passionate on pioneering new frontiers and co-creation of innovative solutions in an ever widening range of cementitious binder systems including Alkali-activated Materials and Geopolymer concretes. DELTA Concrete Consult BV, is an independent consulting company specialized in providing Materials Science- as well as Materials Engineering services in the field of Advanced Concrete Technology and Cementitious Composites for the construction industry.